The Pout Fish was from TIME magazine’s Top 10 Childrens’ Books of 2008, and a New York Times Best Seller. Appealing cartoonish illustrations. 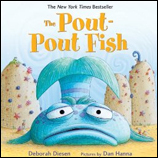 Younger kids will love the repetition of the verses in this tale of a pout-pout fish.